As I was strolling down Solonos street with a friend of mine, the goofiest thought crossed my mind, I thought to myself “How do you enter those stores that have their window displays on the first floor and actually look like they have no front or back or any entrance at all”? And what’s more, I asked my friend and he looked at me as he was having the same “epiphany” that I had at that exact moment. Well, a few minutes and loads of wacky assumptions later, my eyes fell upon a small sign. It was an art gallery, housed in a restored 1960s/1970s building in the city centre. The name of the gallery was Gallery 7 and as I discovered a few seconds later the entrance of this unique art space was indeed the main entrance of the apartment building (yeah, I know). 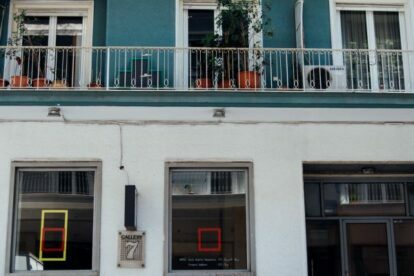 Gallery 7 was launched in 1983 and since then it has showcased more than 300 established and emerging Greek artists. The gallery founders’ motto is that “At Gallery 7 we say “YES”, to mature artists with a fresh perspective, we say “YES” to newcomers who don’t copy old concepts.” Thus, it constitutes a contemporary art space that promotes pluralism by welcoming painters, sculptures, visual artists who practice traditional and new artistic means and methods of expression. In other words, visitors dropping by Gallery 7 have the chance to catch a glimpse of the Athenian art scene and its new formations.